Messages on cloth hang at the knotted grotto art project next to The Cathedral Basilica of Saints Peter and Paul, before Pope Francis' upcoming trip, Thursday, Sept. 24, 2015 in Philadelphia. Messages for the project were gathered worldwide, and by passers by who wrote their messages on strips of cloth and then tied the fabric in a knot. In the weeks leading up to Pope Francis' visit in Philadelphia, many wondered whether he would stop to observe the community art installation known as the 'Knotted Grotto' at the Cathedral Basilica of St. Peter and Paul. On Sunday, before delivering a Mass before hundreds of thousands gathered in Center City, Pope Francis took a moment to step out of the now iconic Popemobile and walk through the grotto. 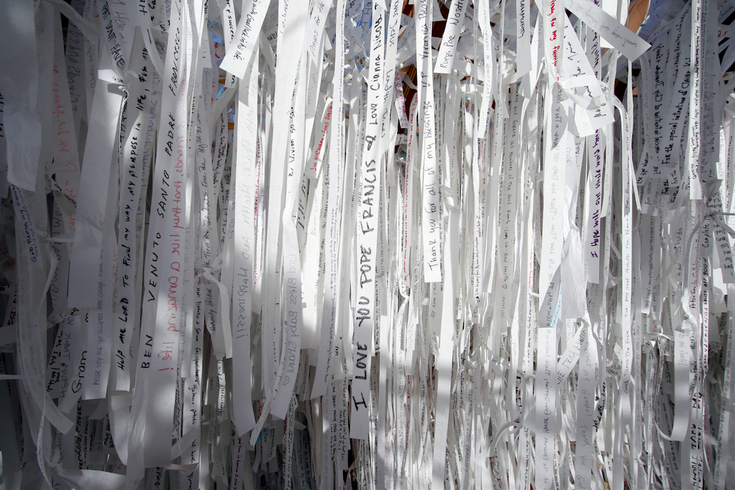 The project, inspired by lead artist Meg Saligman, draws on the prayers of more than 100,000 Philadelphians and global citizens who wrote their wishes on strips of cloth tied into knots and suspended from a fence. The exhibit references the devotion of Mary as an "untier of knots" and personal struggles that individuals and communities face throughout the course of life. For the past week, residents and pilgrims have been wandering into the grotto to write their own prayers, tie them to the fence and remove one of the prayers left by another person. A prayer is said for the person whose knot was removed and it is then restrung to the fence. The project received funding from the nonprofit homeless advocacy group Project Home, which organizers had hoped would garner the attention of Pope Francis. For those who participated, the blessing of Pope Francis marks a culminating moment in a public art project that has fostered community bonds and celebrated faith.